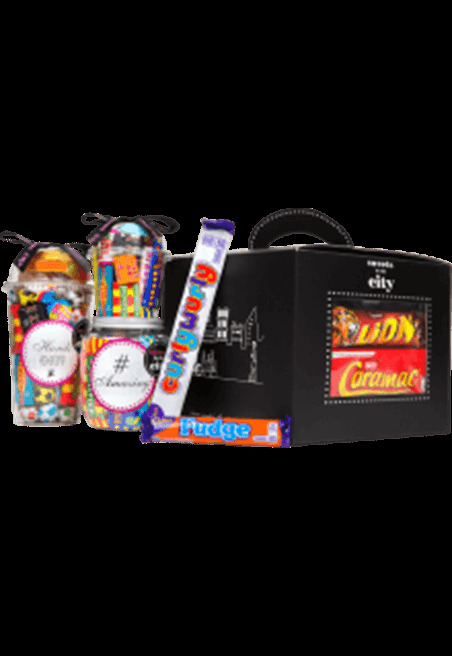 Relive your school days with these tuck shop favourites in our tuck shop box! 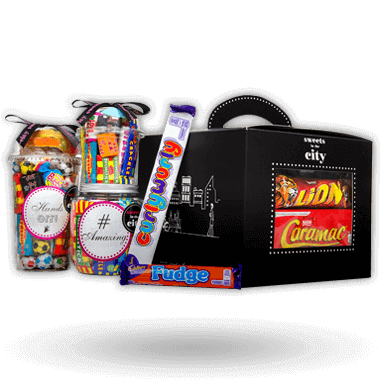 This lovely collection of tuck shop sweets and retro chocolate bars found in Sweets in the City's tuck shop box is guaranteed to put a smile on the face of any nostalgic sweet lover! 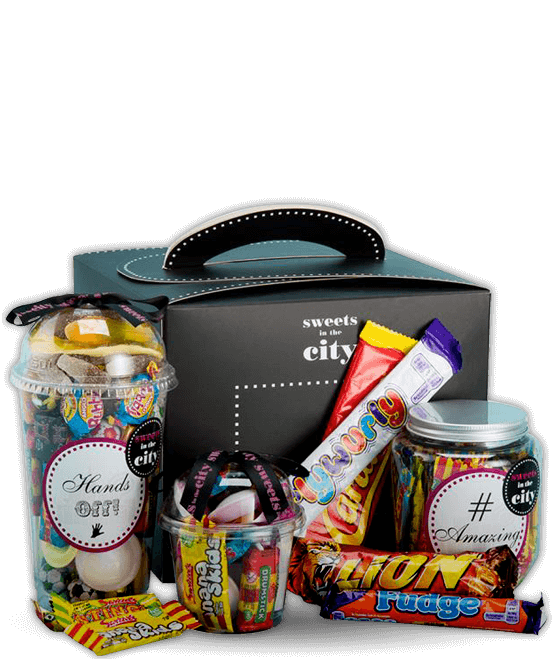 Sweets in the City's Tuck Shop Sweet Box comes filled to the brim with a whole range of old-school tuck shop sweets and chocolate bars. 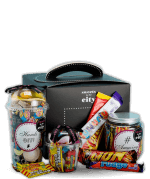 Our tuck shop box comes with everything you could want: from classic retro chocolate bars like Lion bar to Love Hearts, to Refresher Bars and even Curly Wurlys, this collection is a real tuck shop throwback to the sweets and treats of your school days. 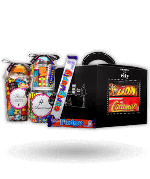 What's Inside the Tuck Shop sweet box? *Please note that all nutritional information for all wrapped products are listed on each bar. #Amazing Little Jar of Joy - Product 1: Glucose syrup, sugar, vegetable oils (palm, palm kernel), acidity regulators: citric acid, malic acid; emulsifier: glycerol mono stearate; flavourings, stearic acid, modified starch, lysed SOYA protein, anti-caking agent: magnesium carbonate; magnesium stearate, colours: ammonia caramel, anthocyanin, copper chlorophyllin, curcumin, lutein, paprika. Retro Classic Little Shake - Product 1: Glucose Syrup, Sugar, Water, Palm Oil, Colours (Vegetable Carbon, Anthocyanin, Paprika Extract), Beef Gelatine, Acid (Citric Acid), Fruit Juice Concentrates (Pineapple, Apple), Emulsifier (SOYA Lecithin), Flavourings, Aniseed Oil, Spirulina Concentrate. Product 2: Sugar, Maize Starch, Dextrose, Acid: E334, Acidity Regulator: E500; Flavourings, Colours: E100, E132, E162. Product 3: Sugar, Acidity Regulator: Malic Acid; Stearic Acid, Sodium Bicarbonate, Modified Starch, Magnesium Stearate, Anti-Caking Agent: Magnesium Carbonate; Flavourings, Colours: Anthocyanin, Copper Chlorophyllin, Curcumin, Lutein, Paprika Extract. Ingredients on wrapper: Mini Me's, Love Hearts, Refresher Chews, Drumstick Lollipops. *Please note all ingredients are listed on the back of all branded wrapped products.